Carrots used to come in many colors until the Dutch bred the orange color in the 17th Century as a tribute to the Royal House of Orange. This blend of red, yellow, purple and white make beautiful snacks and adds color to salads. Some shades will lose color when cooked. Some gardeners like to soak the seed a few hours to aid in germination. 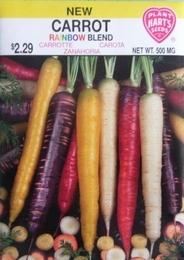 Try planting radish seeds in the row with carrots. The radish will sprout quickly to mark the row and will mature to be harvested fast so as not to compete with the carrots.